Sea lions entertain the girls at Port Stevens State Park. Exploring the great outdoors is a concept lost on most youth today. The digital age has ushered in a generation of children who would rather use their digital devices within the confines of an available Wi-Fi signal than to go outside and play. For precisely this reason, it is imperative children are exposed to nature and their surrounding environments if for nothing else than to remind them there is a whole wondrous world out there and they are a part of it. “Glamping” is a new term used to describe a method of exploring the outdoors, but still having some of the luxuries and comforts of home. Imagine, a primitive cabin located next to a beach that has bunk beds and electricity to provide heat, but no TVs, no computers, no Wi-Fi. Instead of a kitchen there’s an available fire-pit to make fires and then cook over. Oh, and the only available restroom in the evening is the one you construct. Talk about getting back to nature. The girls visit the house featured in the movie Goonies. 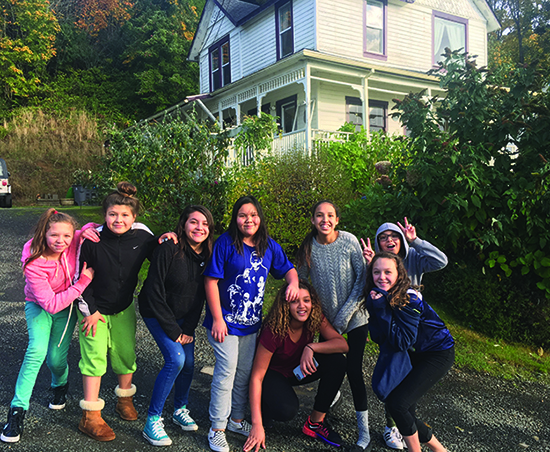 For eight opportunist youth, plus their two chaperones, this was precisely their set of circumstances as they unplugged for three days and two nights in order to experience the great outdoors, namely the Seaside, Oregon coastline. Jacynta Myles-Gilford, Kendra McLean, Savannah Black Tomahawk, Hazel Black Tomahawk, Lovaiya Guardipee, Tahlanna Guardipee, Mirayna Guardipee, and Ariyah Guardipee were all glamping first-timers eager to try out the new experience. Their chaperones were Barbara Hinchcliffe, Therapist at Behavioral Health, and Monica Holmes, MSPI Grant Behavioral Health. During the three-day adventure along Seaside’s coastline, each young lady learned some basic outdoor essentials, like how to start a campfire, prepare food, and to cook over a campfire. They were introduced to financial literacy as well. Each participant was given a per diem to cover a meal out, souvenirs and entrance fees to various activities. Many of them learned to budget their money wisely and save for a rainy day. Stormy weather made-up most of their first two days at the coast, however that didn’t stop the girls from having fun and finding new experiences. Despite the wind and heavy rainfall, the girls geared up in rain ponchos and explored the Seaside beach for adventures in the surf and sand. Whether it was charging up sand dunes or splashing around in the ocean, there were plenty of smiles to go around. 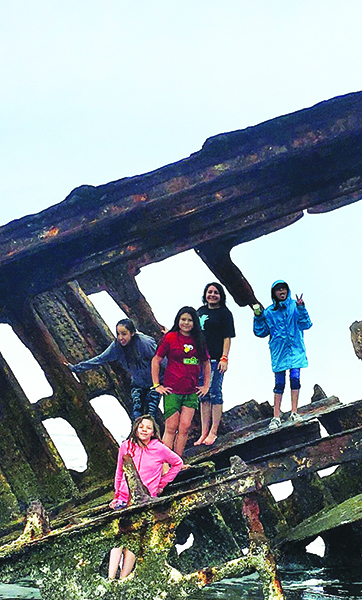 A high-tide adventure was found at Fort Stevens State Park where the Peter Iredale shipwreck remains along the shore. The youth reveled in the sea foam, waves and climbed the wreck like a jungle gym. They also collected a variety of seashells, sand, and other beach trinkets for their memory cups they created. While exploring their surroundings, the group came into contact with a variety of animals, such as elk, deer, raccoons, sea lions, and seals. In fact, at one of the coastal docks was a host of seals that entertained the girls with their funny antics and graceful swimming. When the girls bought sardines and tossed them out for the seals to eat as snacks, the seals gave a loud applause through their vocalizing. The group came into contact with lots of other marine life when they enjoyed a tactile adventure at the Seaside Aquarium. A favorite spot was the octopus tank where those brave enough could reach into a water tank and feel the underside of octopus tentacles. The touch tank exposed the girls to a wide variety of local sea life located in the Pacific Ocean. 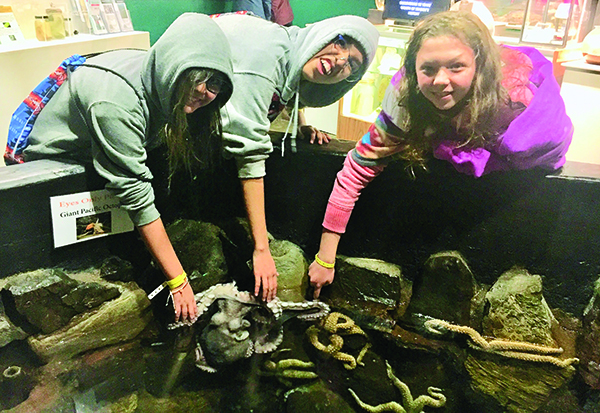 Creatures like starfish, anemone, and sea urchins beckoned them to learn more about a range of textures, colors and habitats of each animal through a completely hands-on approach. “I liked seeing such big waves. I’ve never seen ones like that before,” added 14-year-old Hazel. 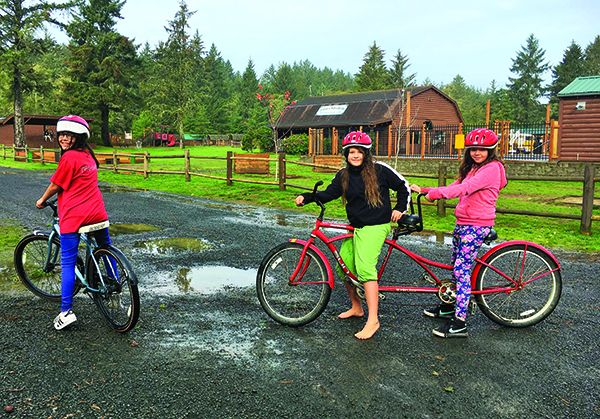 While she enjoyed the getaway and seeing all the sights, 13-year-old Lovaiya said she “learned to be prepared” when it comes to the outdoors and inclement weather. 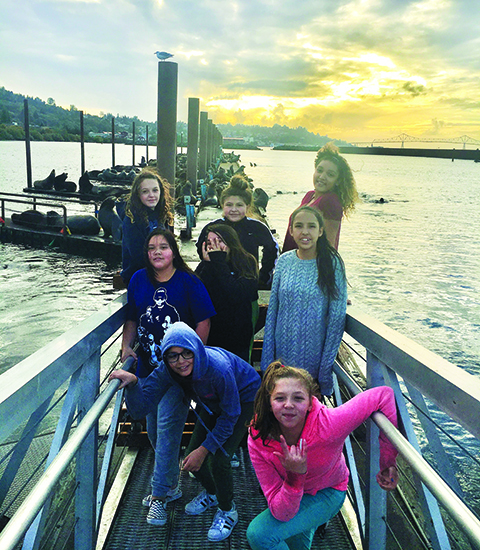 This entry was posted in Education, News, Tulalip News and tagged Glamping, Native Youth, Tulalip Tribes by Kim Kalliber. Bookmark the permalink.